It’s been a summer of silk crepe for me. 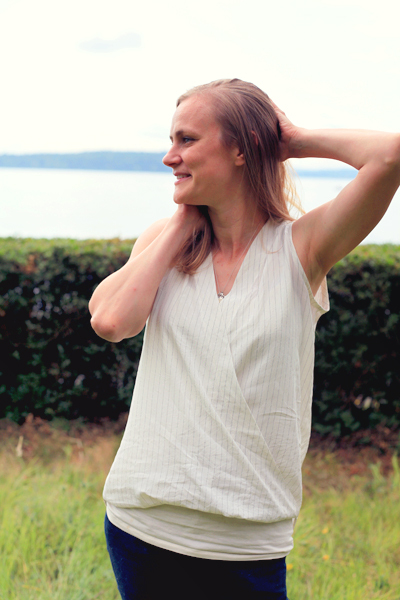 First there were last month’s Polly tops, and now there’s this loose, fun wrap top made from Mood Fabrics’ pinstriped silk crepe de chine. The pinstripe in this particular fabric reminded me of something you might see on a man’s shirt, but the softness of the silk felt very feminine. 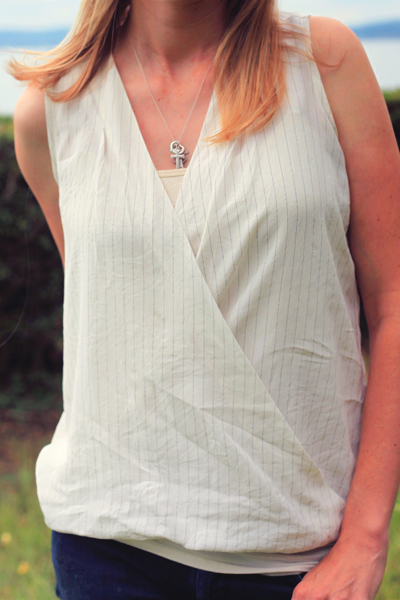 And, while I could easily imagine it as a Grainline Archer, a pattern I’ve previously made and wear all of the time, I wanted to play up the softness of this fabric a bit more, so instead I chose the loose wrap Dotty Blouse from Style Arc. The pattern features a wrap front created from folding the front piece back on itself. 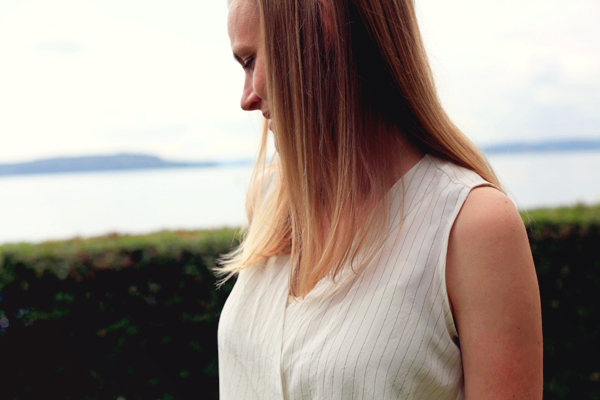 A silk crepe de chine is a perfect fabric for this type of top since it’s the same on both the front and the back. The neckline is meant to be tacked where the right side and the left side cross, providing a bit of modesty, but I’ve left it open for now and am instead wearing it with a nursing tank. The pattern calls for sleeves, but at the encouragement of my husband, I decided to go sleeveless for this version. It has been a warm August after all! I used my favorite sleeveless blouse, the Sewaholic Pendrell, to help me figure out how to cut the armhole. In case you’re curious, I had to remove about an inch at the top of the shoulder, add a quarter of an inch at the bottom of the armhole, and blend everything in between. I ended up binding the armhole with self-bias binding for a nice, clean finish. The pattern also features a longer back with a rounded hem, and together with the shorter, blousier front, the effect is reminiscent of the trendy I-can’t-be-bothered-to-fully-tuck-my-shirt-in look. I quite like it! 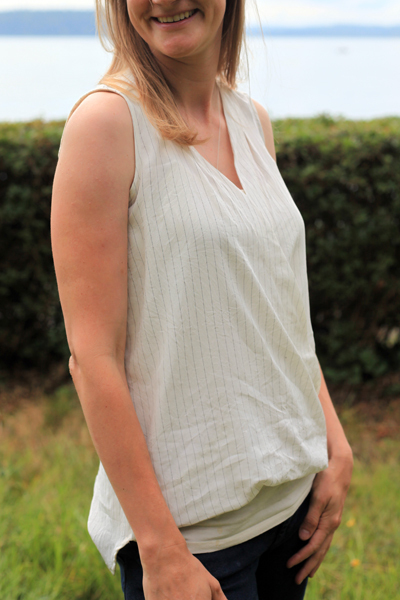 As an aside – while silk crepe de chine is lovely to sew, and even more lovely to wear, one question I have is how to keep the wrinkles out of it?! 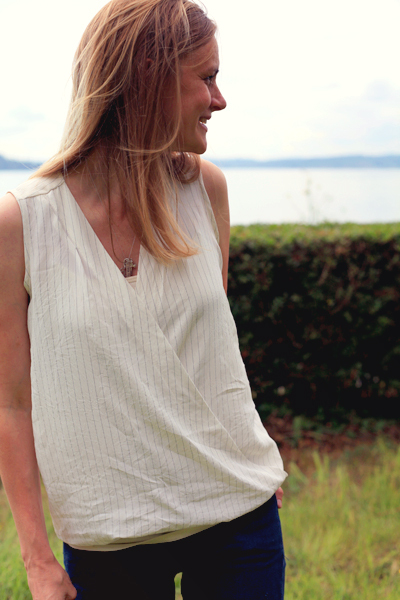 After an hour in the car and on the ferry to get to Bainbridge Island for a weekend with friends, and I might as well have pulled this top out of the hamper instead of off the ironing board! Is that just the way of it with this fabric? Any tips or tricks for keeping your silk crepe de chine looking its best throughout the day would be greatly appreciated! I used a matching ivory silk crepe de chine (left over from previous Mood projects, but similar to this one) for the inside yoke to limit distracting lines showing through the semi-sheer fabric. I also used a bit of bias binding around the back neckline, just as I did with the armholes, to neaten the seam. The neckline facing didn’t get the same treatment since it was just an extension of the front piece. The facing isn’t supposed to be stitched down, but I misread a diagram in the instructions and stitched it down fairly early in the sewing process. Since I was worried the holes left from the needle would show if I ripped out the stitches, I just left it as is. It meant the wrap didn’t have the lovely neckline drape that the pattern intended (see Thewallinna’s version made out of a gorgeous red Mood silk crepe de chine). 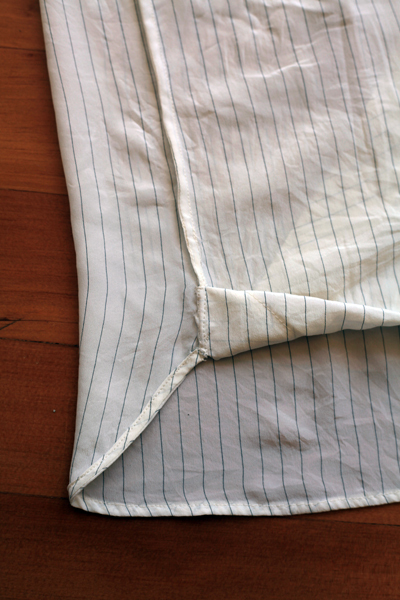 Instead, the front piece wanted to flop open when sewn into the side seam as directed. So, I unstitched the bottom portion of the lovingly sewn French side seam and tried pinning a bit of this and a bit of that until I got a look close to what was originally intended. I ended up with a front wrap piece that met the side seam right at the bottom. To make the front wrap meet the side seam right at the hem, I had to fold up and hand sew the front piece with a bit of extra wrapped around the back. The insides are no longer as pretty as they were when there was only an unadulterated French seam, but it’s worth it for a nicely wrapped front neckline. 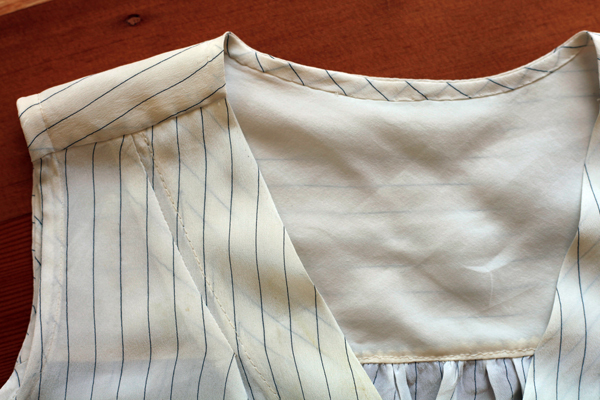 I also decided to hem the back of the blouse using more of the self-bias binding. 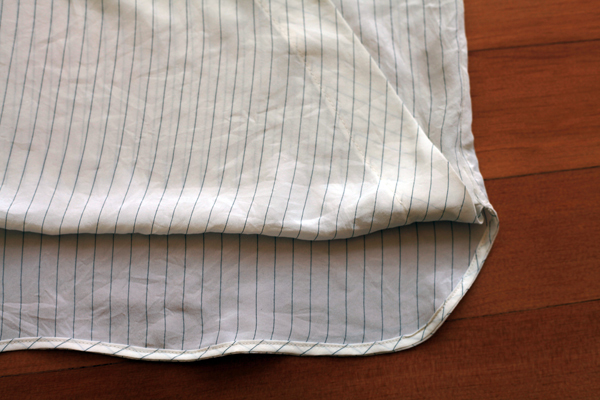 I just couldn’t get the curve the way I wanted using either my machine or my hand to roll the hem. The bias binding worked perfectly! I’m pretty excited to have yet another fun summer top to ride out the remainder of summer. That said, I think I only have one or two more summer garments left in me this year. I’m getting excited for fall! How about you? Are you still stitching for summer (or winter, as the case may be! ), or are garments geared for the next season already starting to fill your sewing queue?